We are now going in to what’s traditionally known as the “hungry gap”. This is the time of year after last year’s supplies have been exhausted, the apples, root vegetables, dried pulses gone, and the new fresh food of spring not yet grown. Of course my reality isn’t hungry at all, because we just go to the shops and buy what we need, but you can feel its shadow in the veg patch. So we have an impressive mound of pink stems, topped with rapidly expanding softly billowing green leaves, waiting to be picked. 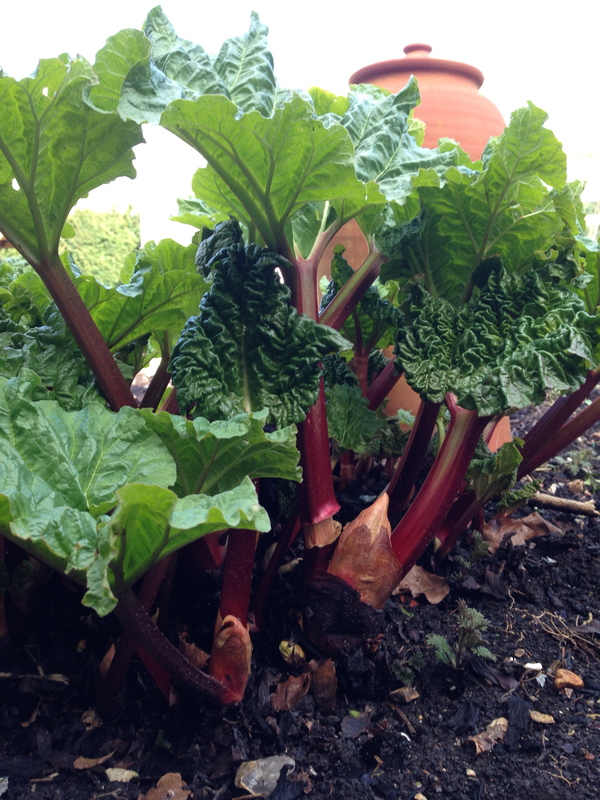 I sometimes force our rhubarb, but it is good, tender, early and pink without forcing, so I usually don’t bother. Every now and then, roughly whenever I remember / can be bothered, I will wander (this year squelch) to the veg patch and pull up armfuls of the stuff, cutting the leaves off there and then and dropping them in the compost bin, before carrying the leaves back to the kitchen. I only ever do about 4 things with it, but since I love them all, that is just plenty for me. Stew it – this gets eaten as is, or made into crumble. Either way it is a dream vehicle for custard. Tart it – the Raymond Blanc recipe is the tart of choice, click here to see. Sauce it – similar to stewing it but with no sugar, and pressed through a sieve to get a smooth sauce perfect for mackerel. Drink it – Hugh F-W’s rhubarb syrup recipe (River Cottage Year – rhubarb, orange juice, sugar, stew for 10 mins, strain) to drink with fizzy wine is a fun option from time to time. The boys are fans too (although they don’t get to try option 4), but obviously I go a bit easy on the quantities with them. 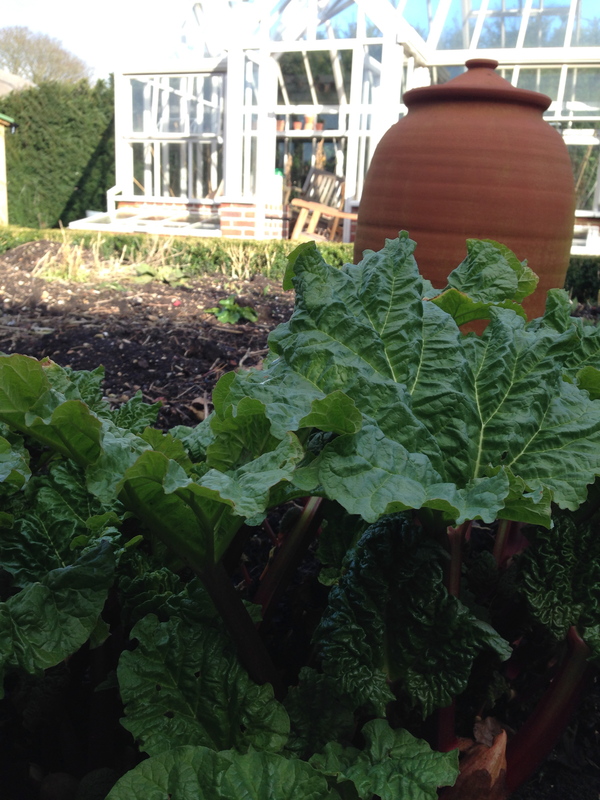 Rhubarb is deservedly famous for its tummy wobbling properties (all that oxalic acid), and in such small bodies, the tummies wobble quite easily.